Nothing’s cooler than a big burly bulldog; stocky, muscular and perpetually smug. A Black English Bulldog though – one that you can buy here – says so much more than cool, with its rare coat color that brings to mind all things mysterious, coupled with the breed’s unique characteristics. Strictly speaking, this bulldog is not included in the standard set of English Bulldogs, according to the American Kennel Club. Show bullies are only allowed to be brindles (striped coats), solid white, solid fawn or fallow, or piebald (or patches of color on the generally white coat). However, this canine, such as the ones available here, are rare occurrences, and make for striking pets. Their shiny black coats give them an amazingly beautiful appeal, combined with the breed’s generally smug expression and tenacious behaviour. The black coat color of this bulldog is a very complex color, as geneticists still try to understand its different makeup. Physically, however, there are a number of beautiful coat combinations for bully. The Black Tri is perhaps the most common of this rare coat color, and the easiest to spot. The black coat appears as a true, shiny dark. Like all ‘tri’ colors, this combination typically has tan points on the eyebrows, cheeks or front shoulders; sometimes around the tail and back legs. The “Black Bi” is a simple black-and-white coat combination, with a sleek black coat paired with a white, and with no tan points. The Doberman-looking “Solid Black” and “Tan-No White” coat combination of the Black English Bulldog, on the other hand, is an all-black bully with tan points on the eyebrows and legs. The Black Piebald on the other hand, is a generally white canine with black circular patches (and not small spots) all over its body. Another rare type is the “Black Red and White”. Typically, this coat combination looks like the “Black Tri”; but when put against another dark object, or observed under the sun, the coat gives off a warmer, dark red sheen. As with all dog breeds, the proper care and maintenance of this rare bulldog plays a big role in keeping its unique qualities in its prime. 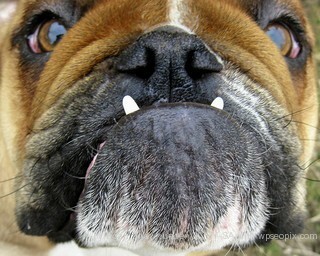 Being a brachycephalic dog, or a canine with pushed-in face, the bully will have a hard time in the heat. Prone to heat strokes, this dog should be given lots of fresh water and shade to keep it healthy and happy. In addition to that, the folds of skin around the bully’s nose are prone to skin infections that can ruin its rare coat, so a good weekly rub-down will be beneficial. Once you’ve chosen a Black English Bulldog, feeding it a high-quality, premium diet will also do wonders in keeping its coat pristine and shiny. Bulldogs are naturally prone to allergies, and cheap kibble – the ones that you find in supermarkets – may have too many fillers in them (such as corn), which a lot of canines are allergic to. This results in dull coats and itchy skin that can make your new best friend unhappy. Read the ingredients of the dog foods that you choose to feed your canine, and make sure that the first few ingredients are from meat (like lamb, beef, fish or chicken) and not harmful grains. Grain-free and holistic dog kibbles are widely available as well, and will be perfect in keeping your new bully happy, health and proud of its unique and rare coat color. Check this site, sometimes them have bullies for sale.